Mexican born composer Luis Escareño (b.1989) began his formal music studies on Viola. His compositional writing reflects much of the world music he studied under percussionist Randy Gloss, with a particular musical emphasis on timbre, rhythm, pulse and elements of improvisation. In the Spring of 2011 the Glendale Philharmonic programmed his work “Reflections of Lost Plains” as part of their “Positive Motions,” concert series. Luis has written and arranged for various ensembles and artists including, Ruslan Biryukov, The Glendale String Quartet, Nonsemble 6, Amy Foote, The Living Earth Show, and The Mobius Trio. Future projects include an Orchestra work for the John Marshall Performing Arts Academy’s annual Bach Rock and Shakespeare festival 2015 (Greek Theater in Los Angeles), and a full length album of collaborations with emerging bay area artists. Luis is a founding members of the bay area concert promoter SFNewMusic, where he serves as Artistic Director of their Sounds of the America’s concert series. He has also served as president of the LACC Composers Club, an organization which helps inner city youth acquire recordings of their compositions. 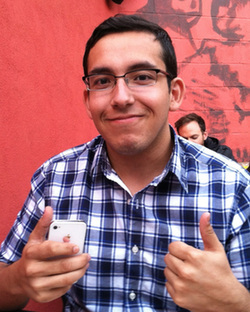 Luis has performed in the Los Angeles area with folk artists such as Bunnies and Kitties, and Homesick Elephant. Luis is a graduate of the San Francisco Conservatory of Music where studied composition with Conrad Susa, Dan Becker, Ryan Brown, and David Conte. Viola with Keith Barry, and Alexander Kalman. Currently he resides in the Bay Area, where he serves as the Membership Manager for the Center for New Music. ©2013 by Luis Escareño. All rights reserved.